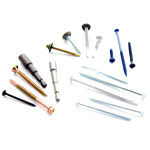 Pierce Plus Screws - 5/16inch Hex Head This single operation fastener eliminates the need for drilling and tapping seperately. This fastener drills, taps, and fixes in one operation. Bright zinc plated FORGED point drill screw for hot rolled rails and purlins. Designed to eliminate the inherrent..
Pierce Plus Screws - DSK Philips No3 Recess This single operation fastener eliminates the need for drilling and tapping seperately. This fastener drills, taps, and fixes in one operation. Bright zinc plated FORGED point drill screw for hot rolled rails and purlins. Designed to eliminate the inherrent.. Round Head Recessed Twin Thread Woodscrews - Black Japanned For further information on Round Head Recessed Twin Thread Woodscrews or any other product, contact our friendly sales team on 0121 544 0055. To buy Round Head Recessed Twin Thread Woodscrews select the quantity required from the table..
A high quality range of screws ideally suited for use in all types of hardwoods, laminated boards, chipboard and fibre boards. Can also be used in plastics and UPVC. This type of screw has a sharp point angle of 35 degrees which allows easy and accurate starting on hard surfaces such as laminated and..